Strasser and Coverley's visual poem is a multimedia meditation on the nature of memory. By choosing pulsing dots as if from behind a veil, the reader activates collages of photographs and ambient sounds, representing the process of trying to recover lost memories, which surface and fade in and out of intelligibility. Author description: ii — in the white darkness is an interactive piece about memory. The work was created by Reiner Strasser in collaboration with M.D. Coverley (Marjorie Coverley Luesebrink) over a period of 9 months in 2003/04. It assimilates and reflects the experience with patients fallen ill with Alzheimer's or Parkinson's diseases, showing the fragility and fluidity of memory from a subjective point of view. "It was not the erasure that mattered so much as the act of trying to recover what we no longer can identify." (M.D. 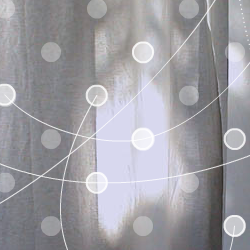 Coverley) From the pulsing dots of the background-interface different events can be started, played, and combined. In this process the experience of remembering and loss of memory can be re-created in the appearance and disappearance of words, pictures, animations, and sounds. Memories (readable with a general metaphorical meaning) are unveiled and veiled in transition at the same time, arranged by or using your own memory. Instructions: Click white dots to recall memories. Clicking on the symbol in the lower right corner will display which dots can be clicked. Clicking the line in the lower left corner displays a quote. Previous publication: ii — in the white darkness was published in January 2004 on Strasser's site, http://nonfinito.de/ii/.